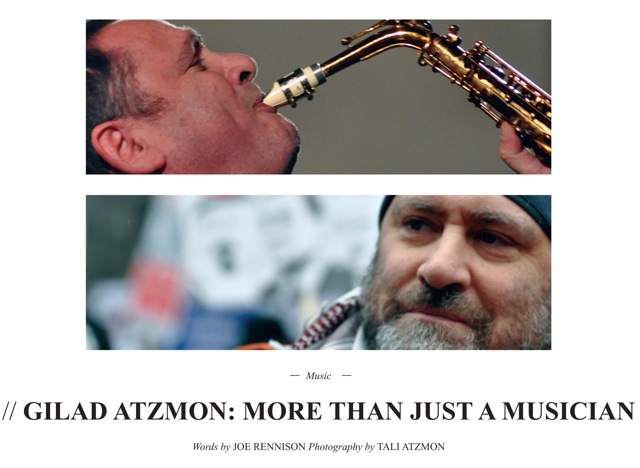 Gilad Atzmon: Ahead of our London Jazz Festival Concert (Arts Depot, November 18), I was interviewed for the London Student Paper by Joe Rennison. Few students currently at University of London will remember Gilad Atzmon’s gig at SOAS in 2006. His performance was exemplary, as all of his live performances are. Four years later, Atmon is still gigging, still writing and still pushing the boundaries of thought and expression. arrive I spot his name on the October listings for Ronnie’s, a testament to Atzmon’s status within the Jazz community. We meet and go around the corner for breakfast. On 18 November, The London Jazz Festival will play host to Atzmon and the Orient House Ensemble (OHE) as they celebrate their 10th anniversary. The group is Atzmon’s mainstay and has seen him develop as a musician. London Jazz Festival in association with BBC Radio 3 presents: Gilad Atzmon and The Orient House Ensemble Tenth Anniversary Celebration. People have said to Atzmon that The Tide Has Changed is the closest thing to his live show. The recorded Atzmon and the live Atzmon are distinct. Live, his improvisations are often hard bee-bop that make you sit up and listen. His albums tend to be more melodic and incorporate Middle Eastern styles as well. Particular highlights on the album are Bolero At Sunrise, Atzmon’s take on the well known Ravel tune, and We Lament, which seems to echo aspects of Michael Brecker’s Ballad Book. The album is also an example of the close relationship between Atzmon’s music and his writing. The title of the album refers to the Arab-Israeli conflict. “I think that the tide has changed,” says Atzmon. It is another example of the overlap between Atzmon’s music and his political thought. Certainly, Atzmon is not afraid to ask questions. He is true to himself and fearless of criticism. “In the beginning, when I started to say what I'm saying, a lot of political groups tried to cling to me and I had to shake them all out because once you start to work with them you have to fit into an agenda. I don't want to do anything with the left wing. I don't want to do anything with the right wing. I don't want to anything with anybody. We speak at length about many different issues, from philosophy to politics to music. The pertinence of the topics Atzmon speaks on are exemplified when a young women on the table next to us interjects into our conversation. Atzmon was speaking about multiculturalism. She is a black woman who lives in Germany. She said that her race dictated how easy it was for her to find a flat in certain areas. If she wanted a flat with other black people then it was easy, but to venture outside these areas made it much harder. We have finished our breakfast and with it our conversation. If you can, attend on 18 November. It’s a rare chance to see every stage of Atzmon’s music in one evening and perhaps what’s more, you will be seeing Atzmon live - a phenomena that can never be reproduced onto record because Atzmon is so much more than just his music.